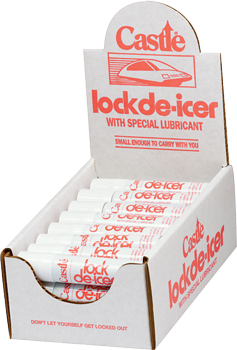 Castle® Lock De-Icer is a specialty product designed for use mainly in cold winter months but may be used as a lock lubricant all year. Its petroleum-based formula will melt ice that has formed in the lock cylinder. 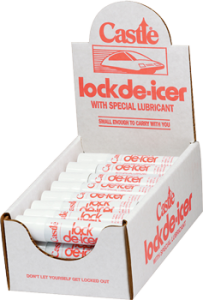 A special lubricant is added to protect locks from drying out and rusting after the ice is thawed. 1. Insert red tip nozzle into keyhole and push against lock. 2. To treat severe icing, repeat procedure. 3. Allow a few moments for thawing action. Store in cool dry place. Keep one in purse or pocket. Keep away from heat source.